If you want a double- or triple-monitor configuration for gaming, make sure the computer’s graphics card can support multiple monitor screens. If you consider a computer a tool for work and nothing else, then a gaming computer is not for you. However, if you like to use the computer for fun and work -- with an emphasis on the fun -- consider a gaming PC. Gaming computers differ from standard computers in a few different ways. As a general rule, they have extra processing power and memory speed. This allows them to successfully generate the high-end graphics involved in gaming. They also can respond quickly to inputs, which prevents lags that can ruin the effect of gameplay. Now if you're just playing Candy Crush, you could probably stick to your smartphone or tablet rather than buying a gaming computer. But if you love the idea of high-end gaming and graphics on the PC, a gaming computer is a must-have piece of hardware. When comparing gaming computers, pay attention to the hardware components below. CPU: The central processing unit is the primary chip inside any computer, including a gaming PC. Faster and more powerful CPUs cost quite a bit more than simple CPUs. But you'll want to buy a PC with as much CPU power as you can afford initially, as the CPU is difficult to upgrade later. GPU: The graphics processing unit is far more important in a gaming computer than it is in a standard work computer. The GPU controls how quickly the computer can render graphics and display them. Because games use a lot of complex graphics, a high-end GPU is a must. Memory: Random access memory (RAM) is the memory area that holds the software you're running. (In this case, it's holding the gaming software.) Holding the software in RAM improves performance. This makes large amounts of fast RAM important in a gaming computer. Notably, this component is relatively easy to upgrade later in a desktop gaming PC, so keep this in mind if you need to save some money upfront. Storage space: This is the area where you'll permanently store software. (This is different from RAM.) Computer storage is either in the form of a hard disk drive (HDD) or a solid state drive (SSD). SSDs cost more than HDDs per gigabyte of storage, but they run significantly faster. Because gaming software requires a lot of space, look for at least 512GB of storage space. Cooling: Because gaming computers run at high processing speeds, they generate extra heat. Most gaming PCs need high-end cooling systems. With a gaming computer, don't forget to invest in a high-quality display monitor. Some gamers choose to use multiple monitors for a more immersive gaming experience. Additionally, a fast-response keyboard and mouse will help you have more success and avoid game lags. Costs for gaming computers are a little bit higher than your typical work computer - about 10% to 30% higher. Basic gaming computers start around $500 to $600; a mid-range gaming PC costs around $1,000. 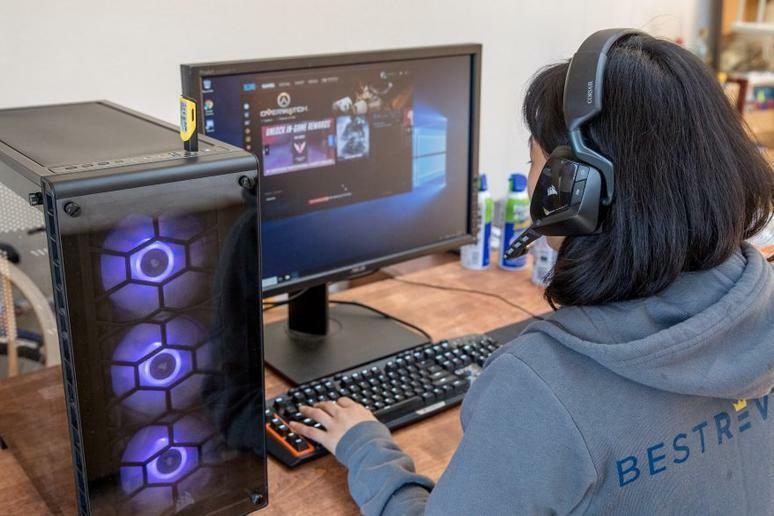 You could pay $1,500 or more for a high-end gaming computer. Q. Are gaming laptop computers available? A. Yes. In fact, gaming laptops often cost slightly less than gaming desktop computers. However, upgrading individual components in a laptop is much harder to do than it is with a desktop configuration. Q. What games can I play on a gaming computer? A. Each type of computer gaming software has a list of minimum specifications. As long as your computer meets or exceeds these specs, you should be able to play the game. Our take: High-quality CPU and GPU chips help provide the boost that's needed for the best results when gaming. What we like: Ships with both a keyboard and mouse geared toward gameplay. Includes a large hard disk drive with 1TB of storage. What we dislike: Occasional problems with booting the computer. Our take: Outperforms most budget-priced gaming computers in terms of graphics performance, which is important for a smooth gaming experience. What we like: Includes a 1TB hard drive storage capacity, which is nice to find at this price point. Fast memory performance. What we dislike: Some models will have problems with power supply failures. Our take: A VR-ready PC with excellent build quality, appealing audio and rendering, and a reasonable price. What we like: Fast Intel Core processor. High-performance memory and awesome graphics. What we dislike: CPU isn't as fast as that of some competitors.